Asian markets rallied Monday as Chinese officials weighed new measures to bolster growth and President-elect Barack Obama pledged the world's largest economy will spend its way out of a recession. BANGKOK, Thailand — World markets rallied Monday as Chinese officials weighed new measures to bolster growth and President-elect Barack Obama pledged the world's largest economy will spend its way out of a recession. Hong Kong's Hang Seng index vaulted 1,198.78 points, or 8.7 percent, to 15,044.87 — its highest close in seven weeks — while Japan's Nikkei 225 average jumped 411.54 points, or 5.2 percent, to 8,329.05. Major European bourses also surged, with Britain's FTSE-100 climbing 5 percent to 4,253.03, Germany's DAX up 6.3 percent to 4,655.32 and France's CAC-40 adding 6.4 percent to 3,178.46. Like their counterparts in the U.S. on Friday, Asian and European investors brushed off news that American employers cut 533,000 jobs in November — the most in 34 years. Instead, investors took heart from signs the world's largest economies are redoubling efforts to revive growth. Chinese officials are meeting this week to discuss possible new steps to expand the $586 billion of stimulus already planned while in Washington a bailout of ailing U.S. automakers appeared to be falling into place. No agenda for the planning meeting has been released, but news reports say Chinese leaders might consider proposals to spur growth by boosting exports, injecting money into China's stock markets and raising social spending. Some analysts played down the meeting's significance, saying the lack of a clear agenda has fueled imaginations. "The recent confidence in the market is a little bit radical," said Xu Zhiyuan, an analyst for Capital Edge Investment & Management in Shanghai. Investors also cheered Obama's plans, announced over the weekend, for the largest U.S. public works spending program since the creation of the interstate highway system a half-century ago. "The market has great expectations about Obama's policy," said Kim Joong-hyun, strategist at Goodmorning Shinhan Securities in Seoul, where the Kospi index surged 7.5 percent to 1,105.05. New demand for infrastructure could benefit South Korean construction and other heavy industry companies, Kim said. GS Engineering & Construction Corp. surged 14.8 percent and Hyundai Heavy Industries Co. gained 14.7 percent. India's government said Sunday it plans to spend an additional $4 billion and cut some taxes to boost the nation's slowing economy, an announcement that came on the heels of the central bank slashing key interest rates by 1 percentage point. Mumbai's Sensex index was up 4.6 percent, while in mainland China, the Shanghai Composite index rose 3.6 percent. "The market has already factored in the bad news from the (U.S.) employment numbers and it seems the U.S. auto sector plan has a high probability of passing and that has also helped improve sentiment," said Castor Pang, an analyst at Sun Hung Kai Financial in Hong Kong. In Washington, House and Senate aides were hammering out legislation that would dole out billions to Detroit's Big Three automakers within a week — but yank back the money if a government-run board and overseer decided the companies weren't taking steps to overhaul themselves and become viable. Australia's benchmark index shot up more than 4 percent, led by banks and the nation's biggest retailers,as 8.7 billion Australian dollars of government handouts began to flow into the bank accounts of pensioners and low-income families. Supermarket chain Woolworths was up 2.8 percent and appliance retailer Harvey Norman gained 3.4 percent. On Friday, the Dow Jones industrials rose 3.1 percent to 8,635.42, and the S&P500 gained 3.7 percent to 876.07. Futures pointed to further gains, with Dow futures up 181 points, or 2.1 percent, at 8,793 and S&P futures up 22.40 points, or 2.6 percent, at 894.80. Japanese automakers gained, with Honda Motor Co. up 5 percent and Toyota Motor Corp. up 3 percent. South Korean Hyundai Motor Co. rose 4.7 percent. Financial stocks — recently a barometer of the turbulence in global markets — also advanced. 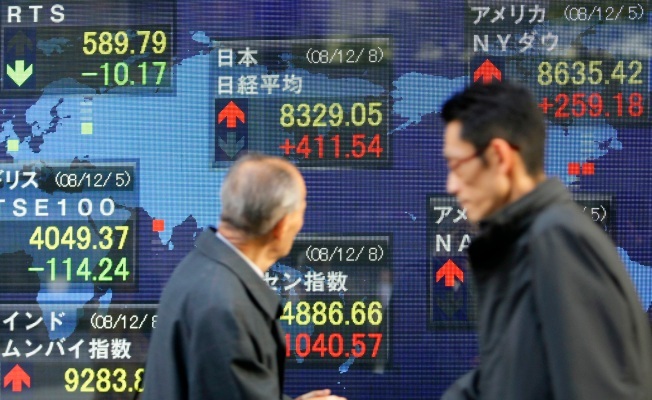 Japan's biggest brokerage, Nomura, rose 3.8 percent. In Hong Kong, Industrial & Commercial Bank of China Ltd. gained 4.5 percent and in Sydney, Commonwealth Bank of Australia surged 6.2 percent. Thailand's key index advanced 2.8 percent, taking a cue from gains around the region and also lifted by signs the business-friendly opposition Democrat Party will have the numbers to form a coalition government in the aftermath of Thailand's ruling party being dissolved for vote buying. Oil prices bounced off four-year lows to above $43 a barrel Monday in Asia after OPEC's president suggested the group could surprise investors with a large production cut later this month. Light, sweet crude for January delivery was up $2.45 to $43.26 a barrel in electronic trading on the New York Mercantile Exchange by late afternoon in Singapore. The contract fell Friday nearly $3 to settle at $40.81, a level not seen since December 2004. Bourses in Singapore, Malaysia and Indonesia were closed for public holidays.